Majors Home Improvement manufactures and installs hurricane shutters for homeowners in Destin, Florida, and nearby communities. Since 1997, we have provided top-notch home improvement products and outstanding installation services throughout the area, so you can trust we have the experience and skills necessary to take care of this project for you. At Majors Home Improvement, we have earned an A+ rating with the Better Business Bureau, as well as numerous industry awards, due to our dedication to our customers. Part of that dedication includes providing our customers with Red Carpet Service during installation. Our craftsmen, all of which are highly trained, will precisely install your hurricane shutters while also being respectful of you and your home. Even better is that we’ll provide a warranty covering the parts and labor, ensuring your investment is safeguarded. 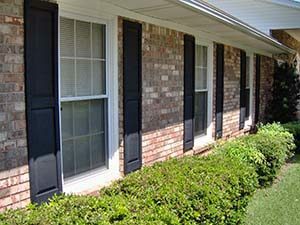 To learn more about the hurricane shutters we install, contact Majors Home Improvement today. When you do, we’ll be happy to schedule a complimentary consultation at your home in Destin, FL.